Sydney Contemporary 2018 secures AUD$21million in sales over five days at Carriageworks; an increase of $5million from 2017. The fourth edition of Australasia’s largest and most established art fair, Sydney Contemporary, attracted 29,000 collectors and art enthusiasts, whilst securing AUD$21million in artwork sales at multi-arts precinct Carriageworks from 12–16 September 2018. The fourth edition of Australasia’s largest and most established art fair, Sydney Contemporary, attracted 29,000 collectors and art enthusiasts, whilst securing AUD$21million in artwork sales at multi-arts precinct Carriageworks from 12–16 September 2018. Approximately AUD$10million of the total 2018 sales will go to artists, demonstrating a powerful moment in the calendar year for artists to help ensure continuation of their practices, and a healthy boost for galleries to continue to support their artists. Sydney Contemporary broke its own record of AUD$16 million of sales at the fair in 2017; the Fair represents the largest short-term concentration of art sales in Australia annually. In 2018, Sydney Contemporary became an annual event and featured more than 80 galleries, presenting 300 leading and emerging local and international artists who installed museum quality artworks across the entire Carriageworks building, spanning seven large-scale exhibition spaces. Further sales are expected to be finalised in the coming days and weeks. Artists at the fair hailed from 30 countries around the world including Australia, Argentina, China, Indonesia, Japan, New Zealand, South Africa, South Korea, Switzerland, the UK and the USA. The galleries were supported by a robust program of ground breaking large-scale installations, dynamic live performances, engaging panel discussions, and experimental moving image art. Participating galleries this year included leading international names: Pace Gallery (New York, Hong Kong, London, Beijing, Seoul, Palo Alto and Geneva), Flowers Gallery (London and New York), Auckland’s Gow Langsford Gallery and STARKWHITE; Sundaram Tagore Gallery of Hong Kong, New York and Singapore; and Singapore’s Yavuz Gallery. Returning domestic galleries included Sydney’s Roslyn Oxley9 Gallery, OLSEN and Sullivan+Strumpf; and Melbourne’s ARC ONE Gallery, Blackartprojects, and MARS to name a few; Ben Quilty presented a major new body of work, paintings and an installation titled ‘Bottom Feeders’ with Melbourne’s Tolarno Galleries, which was a near sell-out. Indigenous art shone at the fair this year with a new body of work titled Always by established artist Reko Rennie showing with Kronenberg Wright, also works at the fair from Tony Albert and galleries including Alcaston Gallery, Utopia Art Sydney, Cooee Art, D’Lan Davidson and Blackartprojects. Emerging artists excelled with artists including Honey Long and Prue Stent (ARC ONE Gallery), Kai Wasikowski (Isabel Rouch Projects), Jackson Farley (Stanley Street), Zico Albaiquni (Yavuz Gallery), Abdul Abdullah (Yavuz Gallery), Clara Adolphs (Chalk Horse Gallery) and India Mark (The Egg & Dart) all selling out at the Fair. The National Art School (NAS) showed for the first time with curated exhibitions of their alumni and students on rotation and sold double they anticipated, selling out with over a quarter of the 14 artists presented selling out, including works by artists Mechelle Bournpraseuth and Kirtika Kain. Established artists also had strong sales, including Christian Thompson (Michael Reid), Gemma Smith and Huseyin Sami, (Sarah Cottier Gallery), Imants Tillers (ARC ONE Gallery), Mirdidingkingathi Juwarnda Sally Gabori (Alcaston Gallery), Rebecca Baumann (STARKWHITE), Tony Cragg (Gow Langsford) and Reko Rennie (Kronenberg Wright). Sydney Contemporary 2018 included a dynamic, five-day public program of talks and tours by industry leaders, including specially curated areas of the Fair: Installation Contemporary, Performance Contemporary, Talk Contemporary and Video Contemporary. This year, Kid Contemporary was a dynamic creative space for children to meditate, play and create hosted by artist and cat-enthusiast Hossein Ghaemi whose work Jumbuck Pishi explored the imagined psyche of cats and was popular with children and families visiting the fair. Highlights of the Fair included the Opening Night Party (Thursday 13th September), which was buzzing with collectors and art enthusiasts, the night featured three performance works as part of Performance Contemporary: Emily Parsons-Lord’s new pyrotechnic performance, Lauren Brincat’s Brava, Bravi, Brave featuring a rhythmic duet between drummers, and a collaborative and ritualistic performance by Mel O’Callaghan and the Sydney Dance Company, where dancers went through a breathing ritual accompanied by a musical score that guided the performers. The VIP Preview (Wednesday 12th September), an exclusive preview event for experienced collectors and public institutions proved to be highly successful for sales, accommodating a more intimate environment for buyers to meet artists and gallerists. Sydney Contemporary also boasted five days of VIP events attracting influential art collectors and taste-makers. The program included a range of events including artist studio visits, exhibition openings, private and corporate collection viewings, privately hosted parties and dinners, lively panel discussions and behind the scenes access to the city’s leading institutions. Installation Contemporary returned as one of the highlights of the Fair, presenting Australian and international artists, whose site-specific installations ranged from the handcrafted to the digital. In 2018, independent curator Nina Miall curated Installation Contemporary to present over 20 works by artists including Jean Dubuffet’s four metre high L’Incivil, 1973/2014, Abdul Abdullah’s new installation Call me by my name that featured several new tapestries, a large-scale installation of stacked barriers with marble and goldleaf The Golden Calf, 2018, from Alex Seton, Penelope Davis with Sea Change, 2017, an installation suspended from the ceiling like a swarm of jellyfish; Robert Jahnke Kaokao, 2017-18, a light installation of a tukutuku chevron pattern found in Maori tribal houses, and 50 ceramic Bagu figures created exclusively for the Fair by 10 artists from the Girrigun Art Centre. Globally-renowned artist Patricia Piccinini reimagined The Field, recently seen at her immersive survey show Curious Affection at QAGOMA, for Sydney Contemporary with a vast site-specific installation of 3,000 sculpted flowers and The Bond as its centrepiece within Carriageworks’ Elston Room. Sydney Contemporary continued until the 20thof September with Sydney Contemporary at Barangaroo; the Fair have partnered with Barangaroo Delivery Authority to commission three internationally established artists that have created large-scale, site-specific installation works that respond to the precinct. Callum Morton’s Monument # 32: Helter Shelter, 2018, a Trump-like figure protruding from the pavement, Mel O’Callaghan’s performance piece Breath repertoire and Cameron Robbins’ Remote Sensor sit throughout Barangaroo’s financial, retail and dining precinct, installed in the lead-up to, and during the fair. Presented in partnership with Deutsche Bank, Sydney Contemporary returned for its fourth edition and is now an annual event in line with major international art fairs around the world. 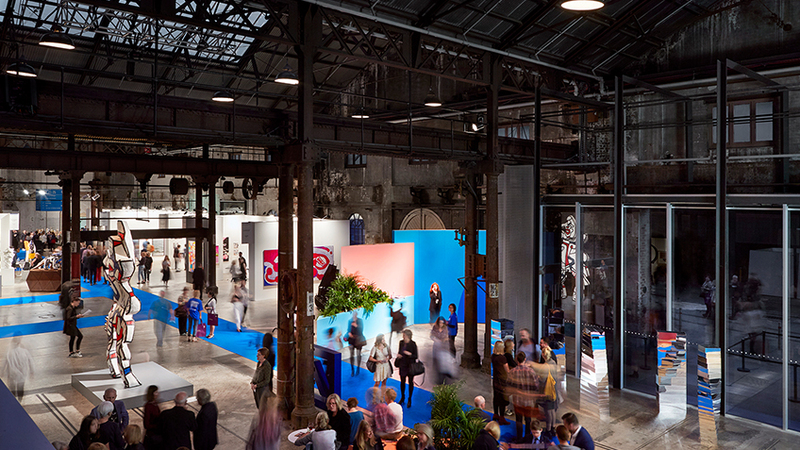 Sydney Contemporary will return next year from 11-15 September 2019 with Carriageworks as the Presenting Partner.